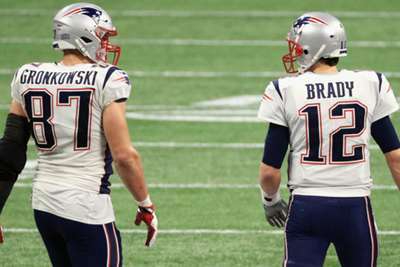 Tom Brady heaped praise on former New England Patriots team-mate Rob Gronkowski after the star tight end announced his retirement. The 29-year-old Gronkowski confirmed the news in an Instagram post on Sunday, revealing he was stepping away from the field after nine seasons with the Patriots. "It's time to move forward and move forward with a big smile on my face knowing that the New England Patriots organization, Pats nation and all my fans will truly be a big part of my heart for the rest of my life," he wrote. "It was truly an incredible honor to play for such a great, established organization." And Brady was quick to respond via the same social media platform. He finishes his career with 521 regular-season catches for 7,861 yards and 79 touchdowns and retires as the Patriots' career leader in touchdowns.